It turns out that Thames Water is doing more at their Crossness facility than just processing sewage from nearly two million Londoners each day. To give you a very unpleasant visual image to go along with that statistic, apparently that's enough sewage to fill 20 olympic size swimming pools every hour. They also own and manage the Crossness Nature Reserve in Bexley, one of the last remaining grazing marshes in Greater London. It's home to almsot 150 types of plants, and various other reptiles, birds, water voles and invertebrates. 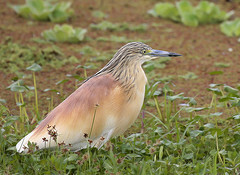 And, as of last week, the squacco heron, which hasn't been seen in London since 1866. You can join the hundreds of bird watchers who have flocked to the reserve to take a peek at the heron. A wildlife viewing screen has been set up to keep viewers at a distance but still give them a good look. A £5 annual membership will get you access to all the best bits of the reserve. Even with a membership though, it's still a 1km walk from the reserve to the nearest toilets, parking and food facilities though, so don't forget to plan ahead.